This outdoor garden bench is crafted in American by Amish woodworkers, which speaks volumes to the quality and care that go into each piece. 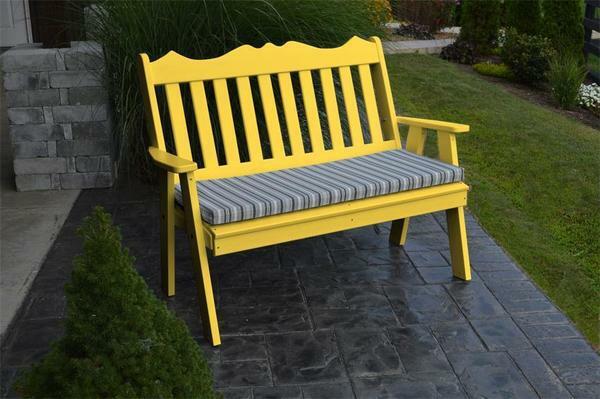 Constructed from eco-friendly poly, this outdoor bench is resistant to fading, chipping, cracking, splintering and developing mold and mildew, which makes it the perfect outdoor bench for the front porch, garden area or patio. Always have a perfect place to site down in your garden with our Royal English Poly Garden Bench. Order online using our secure and safe checkout or call to place your order over the phone with one of our Furniture Specialists toll-free at 1 (866) 272-6773. They are happy to answer any questions and help in any way possible! If you had something different in mind, we offer a wide variety of outdoor furniture in many materials, sizes and styles. Please browse around or call a furniture specialist to find the perfect pieces for your home.